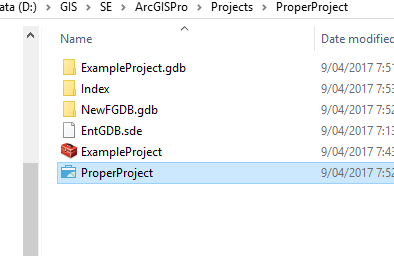 Using ArcGIS Pro 1.3.1 I created a project called TestProject in its own folder. As expected an examination of the TestProject folder in Windows Explorer showed that it contained TestProject.aprx, TestProject.gdb and TestProject.tbx (as well as Index and ImportLog subfolders). I proceeded to do considerable work in this project before deciding to rename my project from TestProject to ProperProject. Renaming the project folder from TestProject to ProperProject using Windows Explorer worked as expected but left the old names of TestProject.aprx, TestProject.gdb and TestProject.tbx within it, as expected. b. No option to rename TestProject.tbx to ProperProject.tbx was available. I cannot find this mentioned in the help. 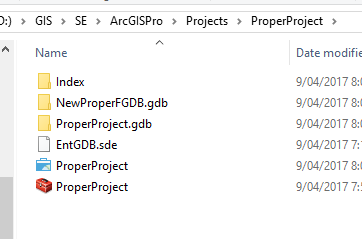 Is it possible to rename an ArcGIS Pro project in a way that also renames the project's *.aprx, *.gdb and *.tbx to the new project name? The ArcGIS Pro Documentation has a page Change project settings which outlines what you can and can't do with your project once it's created. There was a number of steps involved, but it could probably be scripted using arcpy without too much effort. Here's what I did. Made a new test project called ExampleProject (ie your TestProject) which contained three maps, one layout (with map frames from the three maps), Default GDB, extra FGDB, Enterprise GDB connection, Default Toolbox including two models. The maps used data from all three databases. Note these are named according to the original project - ExampleProject.tbx, ExampleProject.gdb etc. Right-click > Rename the Folder connection, which was still aliased to ExampleProject even though it referenced the correct renamed folder. Save my ArcGIS Pro project. My project has now been completely renamed. I could not find any reference to my original project. The Layout showed the map frames from the three maps as per how they were originally set up. As I say, it could possibly be scripted fairly easily, which could be useful for future project renames as required. 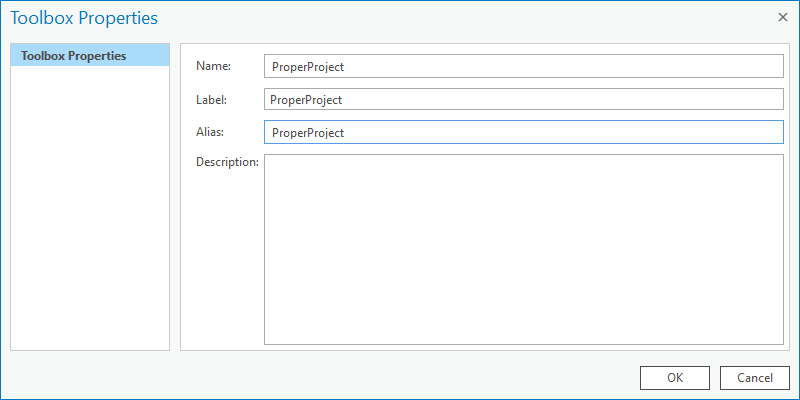 To try and get this addressed for ArcGIS Pro 2.0, I have submitted an ArcGIS Idea entitled Renaming ArcGIS Pro project with its APRX, file geodatabase and toolbox needs to be easy. I would encourage anyone reading this answer to upvote that ArcGIS Idea. My work around for this situation is to create a new blank project with the name I want then drag the layers from the old map into the new one. I do not save any working data in the automatically created gdb or tbx files so I don't need to worry about those. Not the answer you're looking for? Browse other questions tagged arcgis-pro or ask your own question. 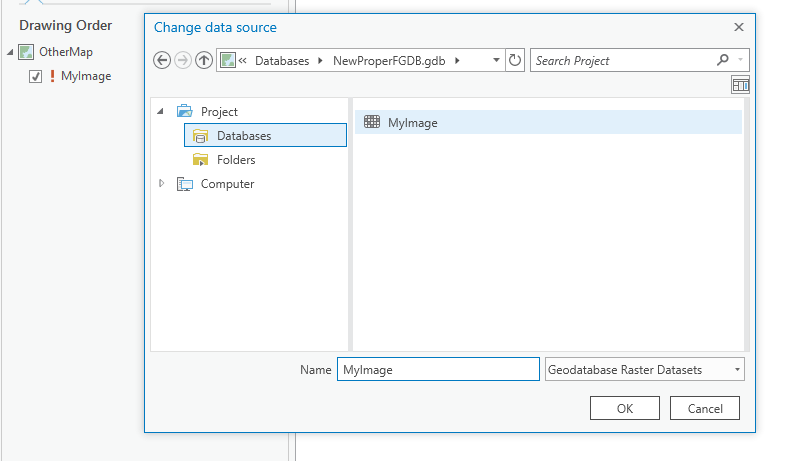 Importing MXD to ArcGIS Pro programmatically? Preventing Project pane of ArcGIS Pro from re-confirming hundreds of Delete requests from multiple select? Multiple-selecting using Shift key in Project pane of ArcGIS Pro? Starting Python Shell Window of IDLE for use with ArcGIS Pro? 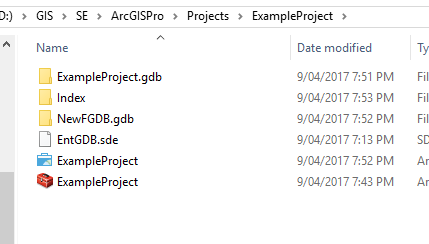 Is is possible to include a folder structure in an ArcGIS Pro Project Template or Package?